If you like mussels, you love them. If you don’t…well, just come back tomorrow when I’ll be talking about something different. No hard feelings, really. There now, all the mussel-haters have gone and left just us, right? Great, more bivalves for us! This recipe a great way to steam clams or mussels that has a bit more oomph than the standard white wine-butter sauce meme. And like all truly great winter meals, it starts with bacon, onions and garlic. serves 4-6 as an entree, 8-10 as a starter, depending on appetites. 1 bottle or pint (12 or 16 oz) dark, sweet porter. Flat beer (such as not-yet-carbonated homebrew) is fine, so long as it is fresh. 5 pounds mussels, cleaned, de-bearded and any dead mussels discarded. First things first: prepare mussels. If you aren’t sure about how to de-beard a mussel or tell if your little bivalves are still alive and good to cook and eat, go watch my friend Becky’s excellent video on mussel basics. 1. 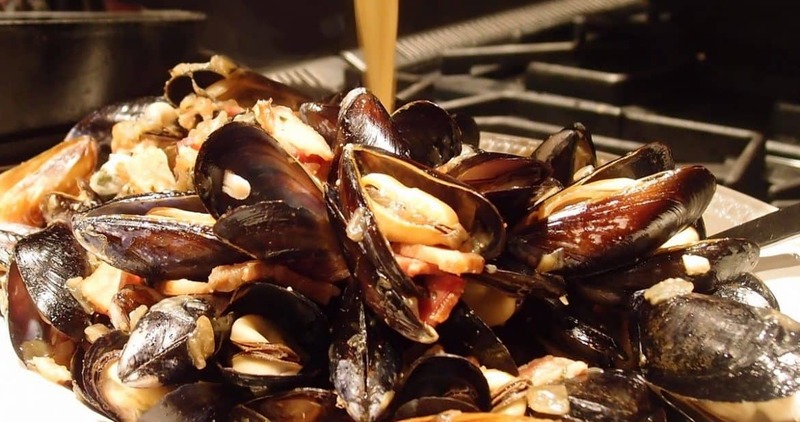 To prepare mussel sauce, saute bacon over medium heat in a pot large enough to hold all your mussels. 2. When bacon has rendered some fat and begins to brown slightly, add in onions, garlic and thyme. Stir, reduce heat to medium, and cook until onion is translucent. Stir occasionally to prevent onion from sticking or scorching. 3. When onion is soft through and has begun to melt, add in porter. Turn heat to high and bring sauce mixture to a simmer. 4. 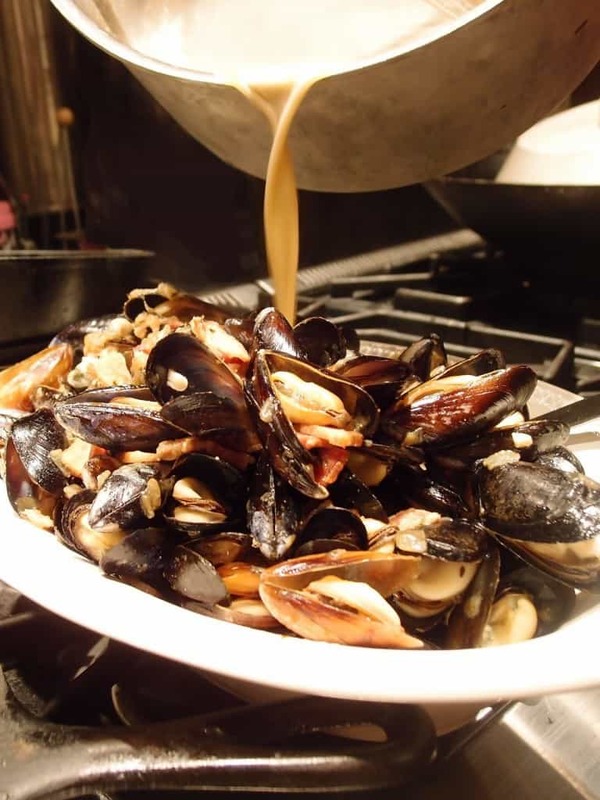 When sauce has reduced by about half and has a glossy, almost syrupy look, you are ready to add in your cleaned mussels. 5. Add in the mussels all at once, turn the heat to high and clamp a lid on your pot. 6. In about 4 minutes, take a peek. If your mussels have sprung open and revealed themselves immodestly to you, they are good to go. If most mussels are still closed, put the lid back on and give them another minute or two. As long as they’re open, it’s better to undercook than overcook. 7. Working quickly so your mussels don’t cool off, use a big strainer to remove the mussels to a serving bowl while you finish the sauce. 8. Turn heat to low and add the softened butter to the porter sauce. 9. Whisk butter into sauce. The sauce should thicken a bit and take on a creamy consistency. 10. Pour porter sauce over mussels. There’s almost always a bit of sand or grit in the bottom of the pot when you cook clams or mussels. Obviously you don’t want that in your finished dish, so pour carefully (don’t dump) and leave the last sandy dregs of sauce in the pot. Viola – winter mussels with bacon and porter sauce. If you have a bit of parsley to sprinkle over everything your dish will look ever-so-pretty. I couldn’t be bothered, I was hungry. Something bread-like to sop up the fabulous sauce is almost essential here. Since you made it to the end of this recipe, is it a fair assumption that you like clams and mussels as much as I do? I love clams! I'm assuming this would also be good with Manila clams? I'd have to make this for just me, my husband unfortunately is not a bivalve lover. I am going to send the link to this post to my daughter. She LOVES mussels. My husband is a man after Alison's husband's heart and I have developed an allergy to some seafoods in my later life, so I'm very cautious now of things like mussels. Alison "sold" you so highly, I have signed up as your newest follower. mussels are always tasty – the sauce is of course my favorite part. My partner doesn't eat shellfish though so it's rare I make a dinner that showcases their greatness… He isn't home this Thursday – I'm on this.